Children of alumni are now in their own leadership roles in the state and experiencing the program they heard about through their parent's stories. Whether we acknowledged it at the time or not, for many of us, our first act of selfless service grew from the kindness and compassion we observed in our parents. With Father’s Day this weekend it’s natural for us to remember the great influence our Dad’s had on us as children and the impact he still has on us today. Children of alumni are now in their own leadership roles in the state and experiencing the program they heard about through their parent’s stories. For this special Alumni Interview Series, we asked Fathers to reflect on their own LRI experience and the impact it had on their children’s decision to apply for the program years later. Similarly, we asked children to share how their father’s experience influenced and inspired their experience in LRI. The alumni were questioned independently of each other and asked to keep their responses a surprise! Did your experience in LRI influence your child’s decision to apply for the program? Yes. Over the years, Kim heard me speak a lot about my positive experiences with LRI, not only with the core program, but with additional activities since then, and of course with my continued close friendship and contact with many members of my class (The Mighty Sigmas of 1998!) As Kim became established in the Providence business world, she would periodically run across some of my classmates whose stories only strengthened the experience we all had with LRI. When Kim was recommended for the program in 2016, she was worried that she was “too young”. In many discussions, I stressed that she should not worry about her age. We had someone who was about her age in our class and he was a very strong contributor (and still is). I also told her that she had no idea what LRI was looking for in setting up the diversity of the class. Plus, the old adage holds true that she would never get in if she didn’t apply. Obviously, she applied, got in, and absolutely loved her experience. The only problem is, she was brainwashed a bit….thinking that her class was the “best class”. How would you describe your child’s leadership style? I would call Kim’s leadership style quietly strong. She knows what she wants, is not afraid to go after it, or direct others to achieve the desired goals. She does so without pounding the table or being loud. Still, when Kim is leading a meeting or organization, it is clear that she is in charge. She is not afraid to jump in and get her hands dirty to do some of the work herself. This only serves to make others around her work that much harder to reach the desired outcome. She will not stop until success is achieved. Did your father’s experience in the program influence your decision to apply? Yes, my dad’s positive experience absolutely influenced my decision to apply to Leadership Rhode Island. When I was first nominated I was reluctant to pursue the opportunity because I felt I was too young and inexperienced professionally. My dad shared a few anecdotes about one of his classmates from ‘98 who was in his mid-20s at the time of the program and thrived in the class. My dad explained that LRI purposely accepts a diverse group of people so that people of different ages and backgrounds have a seat at the table. My dad went on to tell me about the experiences he had in his class. He remembered fondly how the class truly became a family and it was obvious that even 18 years after completing the program he was just as excited talking to me about LRI as he was in ’98. His enthusiasm was contagious and I started filling out my application while he was still only way halfway through his recollections. How would you describe your father’s leadership style? My dad is a talented leader – and I swear I’m not just saying that because he is my dad! Over the years, I have watched him successfully start (and significantly grow) his own Boy Scout Troop in Scituate because he saw a need for another one; act as Senior Warden of our church’s Vestry; and serve on numerous other community boards and affiliations within our hometown and the state. My dad also has a very tactful and polite way of getting people to volunteer for things without them even realizing that they are doing it – it’s very hard to say “no” to the man! 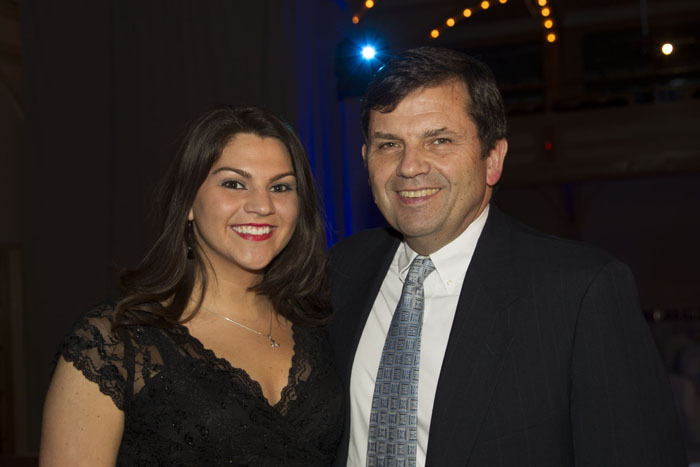 I have also had the pleasure of serving on the board of the Southeastern New England Chapter and Northeast District of the Public Relations Society of America with my dad and have witnessed his leadership style first-hand. What I admire most is the way he listens first, and then responds with his comments. This tactic works well in meetings because it sets a better tone for discussion and creates an opportunity for everyone to say what they want. My dad recognizes that with a little bit of hard work and assembling the right group of people to get the job done, there can be a significant and positive impact on the community. Happy Father’s Day from LRI! May your children catch a glimpse of your love for them through your eyes. May you catch a glimpse of your children’s love for you through theirs. Do you have a unique LRI story you’d like to share? Let us know! Contact Ray Nunez, LRI’s Communications and Engagement Specialist at rnunez@leadershipri.org or at 401.273.1574 x102.